Don’t skimp on the most important meal of the day! 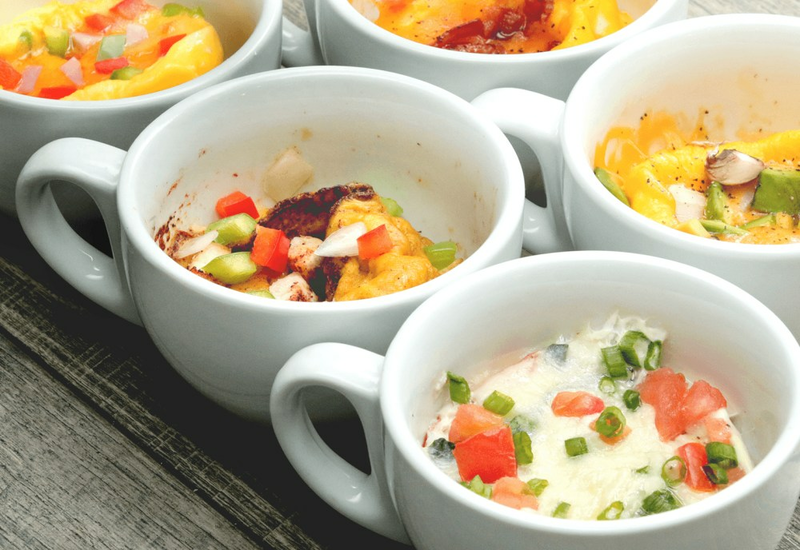 Feed your body right from the start with these fool-proof quick and easy egg omelet in a cup recipes. The possibilities are endless! The combination of crisp bacon and cheddar is a classic. Red and green bell peppers along with cheese and onion makes for a perfect Denver Scramble. Of course, you could keep it super healthy by just using egg whites, spinach and tomato. The California Scramble includes cheese, mushroom and onion. While the Fajita Scramble uses fajita seasoning mix, cooked chicken, peppers and onion. No matter what you choose, all you need is a mug and 60 seconds in the microwave! Pair with a Very Berry Smoothie for a great morning! Add your favorite leftovers to recycle whatever's lurking in your fridge. That way you won't have to worry about preparing anything in advance! It's a great way to save not only time but also money! Per Serving: 389 calories; 23g fat; 9.5g carbohydrates; 34g protein; 421mg cholesterol; 1297mg sodium. I don't know why, but this is one of those recipes that is just fun to watch happen for some reason. I've been restricting myself to only using the microwave for leftovers, but I had to try this out. I remember buying one of those microwave omelette makers and being mesmerized by what was going on. It's like being a kid with an easy baked oven. There's nothing extremely special about this, but it's quick and easy to do before work which I like for when I'm on the go. You have to play around with the cooking times a little bit, depending on your microwave's power and the size of the mug that you're using. Too much, and it all overflows from the first cook. Adding more toppings and doing a second cook is really important though. Otherwise the eggs don't always cook through the right way. Super simple way to spice up your breakfast. I've tried the California scramble and the Denver. I had to watch closely because the eggs ended up overflowing in the wave and making a mess. Keep a close eye on it! quick and easy eggs, perfect if you're trying to feed all the kids in no time - but these won't get confused for anything fancy.